Renoit's Books is a book store in Chorrol's Chapel Street. 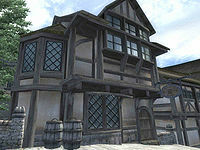 It is found next to the Chapel of Stendarr and The Oak and Crosier Inn. The proprietor, Estelle Renoit, is a bookseller with 600 gold and a Mercantile skill of 30. She buys and sells books. Along with common guides and stories, her wares include the Marksman skill book Vernaccus and Bourlor and the unique Stormrider Scroll, which deals a large amount of area Shock Damage and gives you Shock immunity. The main trading room is on the ground floor and consists of a counter, a reading table and a large selection of books. Estelle lives upstairs from the main trading room, as is usual with Chorrol shops. Her private quarters consist of a single room which serves as dining room, work-room and bedroom. On a higher level are some crates and barrels with some miscellaneous storage while on a table you can find two potions. This store is criticized by Alessia Ottus in a guide to Chorrol for not selling a single copy of the Ten Commands. This page was last modified on 31 May 2018, at 00:10.